All W124 Diesel 2-valve have a shut-off lever (with red imprint "STOP") at the side of the injection pump, to stop the engine in an emergency case. The shaft of the shut-off lever is sealed by a small seal against the oil-circulation system of the injection pump. Here motor oil is leaking often due to mileages > 200,000 km and age-related curing of the seal. 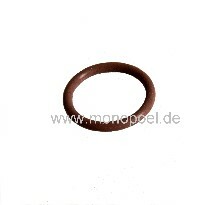 After removal of the shut-off lever the small sealing ring is available and should be replaced by our seal. Our seal made of Viton solves this problem permanently.